Looking for something a little different? 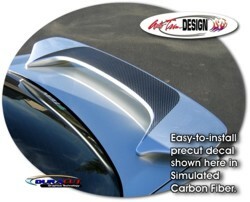 Set your '02-'07 Subaru Impreza apart with our unique one (1) piece Spoiler Enhancement Inset Graphic decal. Available in a wide variety of colors, this easy-to-install decal is designed to fit specifically on the top part of all '02-'07 Subaru Impreza factory spoilers as shown in the image. This kit will not fit any other vehicle.